This program will train students in heating, ventilation and air-conditioning. They will develop competency and basic work skills pertaining to heating and cooling, modern refrigeration, air conditioning and plumbing industry. They will acquire he knowledge and skills to seek career opportunities in a variety of industries such as operating technicians, sheet metal assistant, repair specialist, maintenance technicians, installer, tester and application technicians. 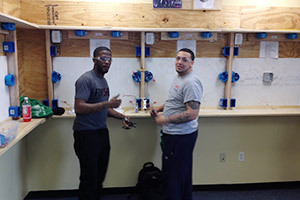 National Career Institute’s Heating, Ventilation, and Air Condition Program provide students in East Orange, NJ with thorough training and practical skills for careers in an exciting field. Graduates of our HVAC training program will be prepared for challenging careers in a variety of industries. HVAC students are required to complete 400 contact hours in order to graduate. Through our courses, students will develop competency and basic work skills required for a career working with heating and cooling, modern refrigeration, and air conditioning and plumbing systems. Our graduates carry the skills and work ethic they learn in our courses with them through their entire lives, regardless of where their careers take them. HVAC program graduates will be qualified for career opportunities in a variety of industries. Some of our students have gone on to become repair specialists, installers, maintenance technicians, operating engineers, testers, sheet metal assistants, application engineers, and more. The HVAC training program at National Career Institute prepares students for exciting careers in a practical field. Browse our website to learn more about NCI’s opportunities for students, financial aid information, and other skilled trade programs. Contact us to speak to an Admissions Counselor about our program when you’re ready to jump-start your career!